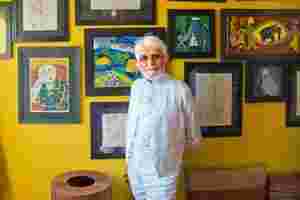 I have a trick question for Pratiti Basu Sarkar, who runs the Centre of International Modern Art (Cima) in Kolkata. It’s a fair question but there really is no good answer—or so I think. I find Sarkar through a chain of friends, and phone her with a request: Could she introduce me to some artists who are emblematic of Kolkata? Sarkar names two from Cima’s roster. She arranges for me to meet them at her gallery. Here’s my trick question: Why did she pick these two out of the dozens of artists that Cima represents? She can’t say that she likes them. It would upset the others in her stable. If she says that she chose them because they are gaining ground in the art world, I will suspect commercial motives and discount her picks. You see why I think this is a question with no good answer. We adjourn to the lounge for a chat. Sarkar sends in masala dosa and dhokla. Basak shows me photographs that he took in Bangalore. The dramatic, colourful images of my hometown look like his paintings. I am more impressed by his three-dimensional books. They are vibrant, playful and thoughtful—like the best children’s books. Chatterjee stitches on canvas—a more original take on kantha embroidery. She teaches art history at a local university, and was the subject of a French photographer. The vertical storytelling in her large canvases reminds me of Chinese watercolours—they make the eye move upward. I ask the usual questions—what inspires them, how do they work—and receive uninspiring answers. We try to find common ground. Chatterjee and Basak talk shop and exchange notes on Charles Wallace grants. Sarkar joins us after an hour. I spring my question on her, right in front of the two artists. Why did she recommend them, out of all the artists that Cima represents? Basak and Chatterjee are all ears too. There is silence. “Mainly because they are articulate," says Sarkar after a moment. It is a brave answer because it does not pander to the two artists sitting with us. “One of the challenges that faces a lot of artists, particularly in Bengal, is that they cannot articulate about their work in English." She tells me about a poor, self-taught artist called Shakeela, who is represented by Cima. Shakeela works in paper collages and later I see her work in the back room. “But she simply cannot talk about her work," says Sarkar. Do artists need to talk about their work? Isn’t it enough that the work speaks for itself? Years ago, I lost a master’s of fine arts degree trying to prove this point—my professors failed me when I couldn’t articulate what my sculpture installation was about—so I have strong views on this subject. We all do. Basak and Chatterjee talk about how “cumbersome" it is to write pages of fellowship applications. “You have to prove what you are doing like a lawyer," says Basak. “I think the auction houses and the market have been very detrimental influences on Indian art," Sarkar says. I wonder if I should tell Sarkar that the person who pointed me to her was Maithili Parekh, director and country head of Sotheby’s India. “Yes, the world now knows that there is such a thing as Indian contemporary art but I don’t think they are convinced by it," Sarkar continues. “The main buyers are still buying our ancient art. Except for a small handful of mainstream, foreign art collectors, contemporary Indian art is mostly being acquired by NRIs. Because what a lot of the contemporary artists are doing in India now has been done in the West 30, 40, 50 years ago. It is not new. It is what the West wants to see of India—the kitsch, the colour, the street scenes, the exoticism. To me, that is untruthful and insincere." A stinging critique stated in a soft voice. I turn to look at the artists sitting with us but they don’t seem offended by it. Chatterjee asks Sarkar to repeat the three things emblematic of Indian art and Sarkar obliges: kitsch, colour, exotic street scenes. What do we art lovers expect from our artists? Do we want them to be worldly and articulate like the late M.F. Husain or reclusive and free from market influences, like the late Tyeb Mehta or Biren De? Should artists engage with the market or be removed from it? Sarkar believes that artists ought to engage with the real world but not the market. She believes they should study philosophy, read books, form communities. “There is a correlation between artists who read and the thoughtfulness of their work. Artists today come to openings to figure out not content but technique… They have become too involved in the wheeling-dealing. In the West, the galleries do that for you." Artists, of course, believe that the galleries don’t do nearly enough. I tell Sarkar about a Delhi art couple who attend openings, parties and deal with media. They complain that it is boring to repeat the same things about their art; but see it as necessary. “Oh, come on," Sarkar scoffs. “There is such a word as ‘No’." “Yes, but artists are afraid to use this word," says Basak softly. Are there any successful artists who are reclusive, I ask. They all think for a minute and come up with one name: Ganesh Pyne. Need to check him out. The difficult truth is that the world views artists like we Indians view women. They are the repositories of our integrity and emblems of our better selves. We hold artists to higher standards because they are engaged in what we believe is a profound pursuit. As Sarkar says, “If art is about anything, it is about a truth. Somewhere in that work, there has to be a truth. It’s why we read literature: to find a truth." Sarkar is a romantic. The more interesting question is, why is she engaged with the market? When I was an art student, Leonard DeLonga, my sculpture professor who I revered, told me I had to “hustle" to sell my work. The question for Cima’s artists is: Do you want a romantic or a hustler to represent your work? Shoba Narayan thanks Cima for a wonderful lunch but is compelled to inform them that south Indians don’t put carrots in their masala dosa. Thanks, though.